White used a truly unique collection of instruments to propel his no-frills style into the limelight. As you will see, his equipment choices evolved slightly through the years depending on which of his many projects he was working on. Here is a breakdown of the guitars he has used through the many phases of his career. 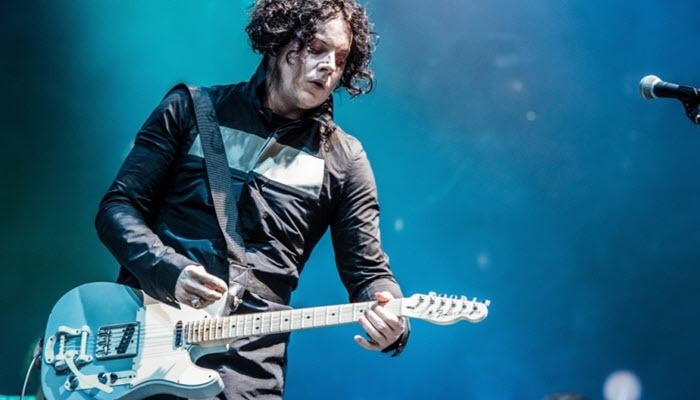 This is the most iconic guitar in Jack White’s arsenal of rare axes. This model was made for Montgomery Ward department stores in the early 60s. 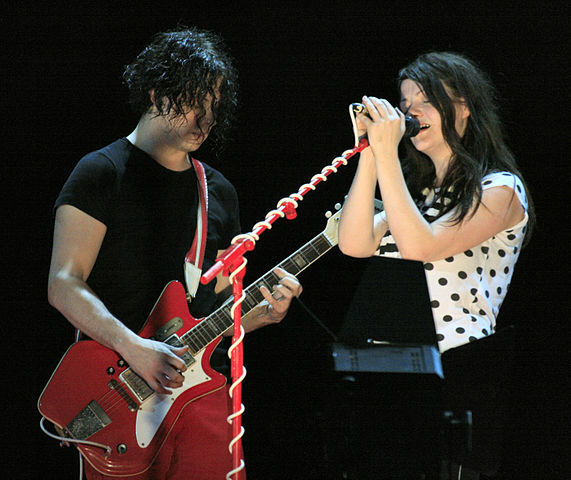 This guitar was White’s workhorse throughout his time with the White Stripes. The new Airline 59 2P by Eastwood. This vintage hollowbody was one of the three guitars White used with the White Stripes. The Airline was his primary axe, but White frequently used the Kay Hollowbody as his slide guitar. Kay Instruments was one of the first companies to make an electric guitar. Blues legend Howlin’ Wolf–a major influence on White’s style–was among the most visible artists to use the Kay Hollowbody. This is the guitar White uses for “Seven Nation Army,” arguably the greatest guitar riff of the past decade. This guitar is commonly referred to as the Robert Johnson model. White began playing this guitar on the White Stripes’ Icky Thump album. For live performances, White uses a tape-on pickup. In an interview for Gibson’s website, White reveals that this guitar is his personal favorite. This custom-made guitar started with a Gretsch Anniversary Junior. White enlisted Randy Parsons to modify the body and add a slew of bells and whistles, creating a truly unique instrument. He installed the same electronics from his Gretsch Triple Jet, a bigsby tailpiece, a lever-activated mute system, light-activated Theremin and a retractable bullet microphone. This guitar is also featured in the film, It Might Get Loud. White is just as particular with the aesthetics of his equipment as he is with their performance. With the Raconteurs, White plated all of his equipment–pedals, amps, guitars–in bronze. This customized axe is based on a Gretsch G5445T Electromatic Double Jet. White added a third pickup (hence, “Triple Jet”) and an onboard MXR Micro Amp. The result gave White a a bronze-plated axe with built-in overdrive. This guitar was intended for White’s tour with Alicia Keys in support of their James Bond theme, “Another Way To Die.” Keys had the box-shaped Bo Diddley model, and the idea was for White and Keys to re-create the image of Bo Diddley and the Duchess. When White’s neck injury sidelined that tour, he took up the same idea with Alison Mosshart in the Dead Weather. Another one of the rarities in Jack White’s collection. Gretsch only produced 12 of this specific model. White found the guitar while touring through Texas in 2007. 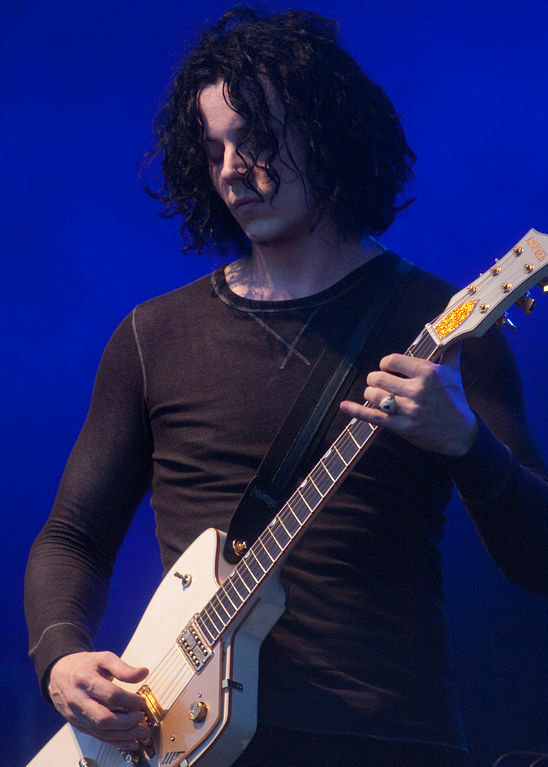 The white guitar was a natural fit in White’s Dead Weather color scheme. This guitar was also used on the later White Stripes albums. 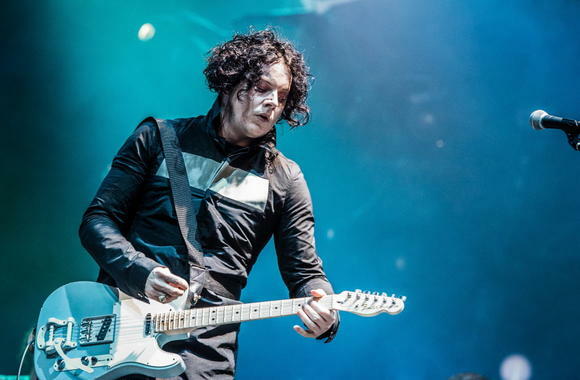 This may be the tamest piece in Jack White’s guitar arsenal, but this American classic was White’s main workhorse on his solo album, Blunderbuss. 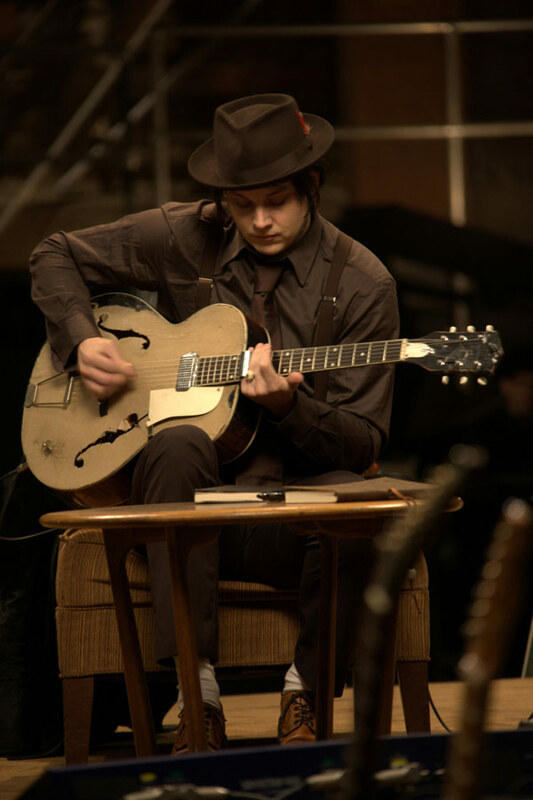 In typical Jack White fashion, the guitar has been outfitted with a Bigsby and painted blue to fit with the project’s color scheme. This guitar has been a mainstay throughout White’s career. He has said that this model is favorite acoustic to play live, because of the bass tones. Given his flair for customization, White has three Rancher Falcons, each with a portrait of a different women on the back. White explains that the women featured on his guitars are Claudette Colbert, Rita Hayworth and Veronica Lake, which gives him a brunette, a redhead and a blonde. Posted by: Jason Schellhardt, writer for the cheap ticket search engine, Rukkus. Very, very good post, even though those aren’t all of his guitars we’ve seen him playing through the years. 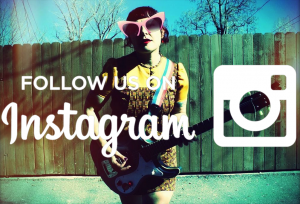 You’ve forgotten Danelectro Baritone Doubleneck, which has been using somewhere in early 2000’s or something. Link where he plays it. May I point out a couple of inaccuracies?– I believe Jack actually begin using the Gibson L-1 on Get Behind Me Satan. That was definitely the acoustic that he used during the tour for that record, if not on the album itself. 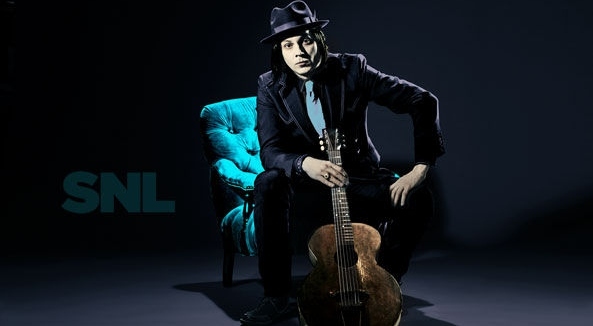 And the guitar in the photo you’ve selected for the L-1 is actually a Gibson Army-Navy that he used on the Blunderbuss record and tour. He talked about it in a 2012 edition of Uncut magazine, mentioning that the neck is “like a tree trunk”. If it’s a 1957 model, then it’s a Jupiter Thunderbird. The modern version of this guitar that Gretsch makes is called the Billy-Bo because the modern version features modifications by Billy Gibbons of ZZ Top. The original version was just called the Jupiter Thunderbird. Fantastic article! Thanks for it a lot. 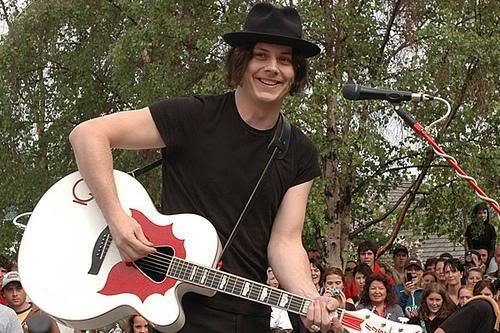 Been a huge fan of Jack White since the White Stripes days. Been lusting to work on one (of any) of Jack’s guitars since day one. 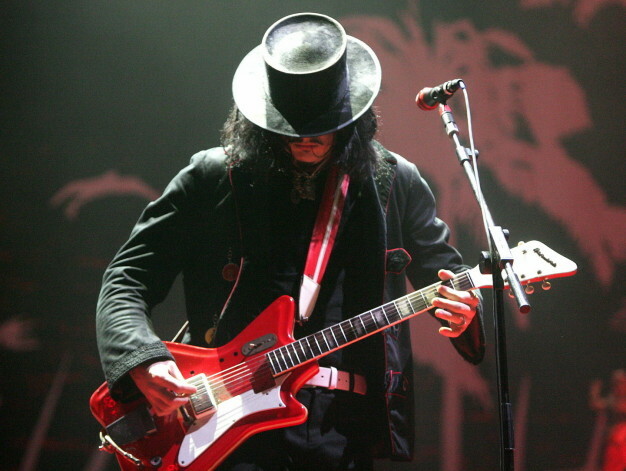 With the White Stripes he also uses a Crestwood Astral Japanese guitar in open E tuning. He also uses a new redesigned version of the Triple Jet on his solo tour called the “Blue Randy”, and presumably after destroying his original solo Tele during his Grammy Performance he now uses a grey one with presumably a TV Jones Filterton pickup in the neck position. 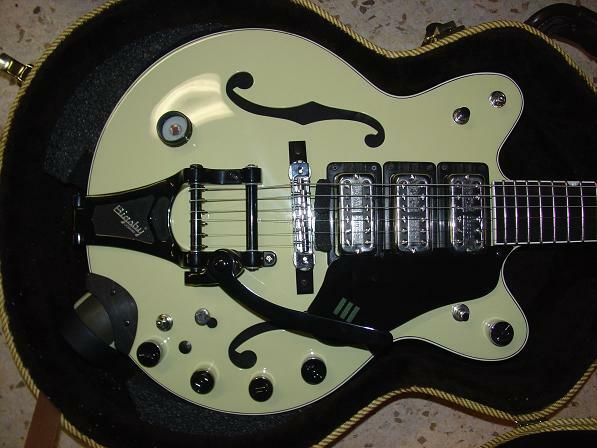 He also got the Gretsch White Penguin during the end of the White Stripes days and never plays it with the Dead Weather. And all of the Dead Weather guitars are custom by Randy Parsons, including a black flipped lefty Billy Bo that he used on the second Dead Weather tour. The only Dead Weather guitar that wasn’t made by Parsons “Bond” related or otherwise is a Daddy Mojo cigar box guitar that Jack occasionally used during, “Will There Be Enough Water,” on tour with the Dead Weather. Also when performing with Wanda Jackson, he plays a vintage solid body Gretsch Chet Atkins, and a different grey Tele with Loretta Lynn. 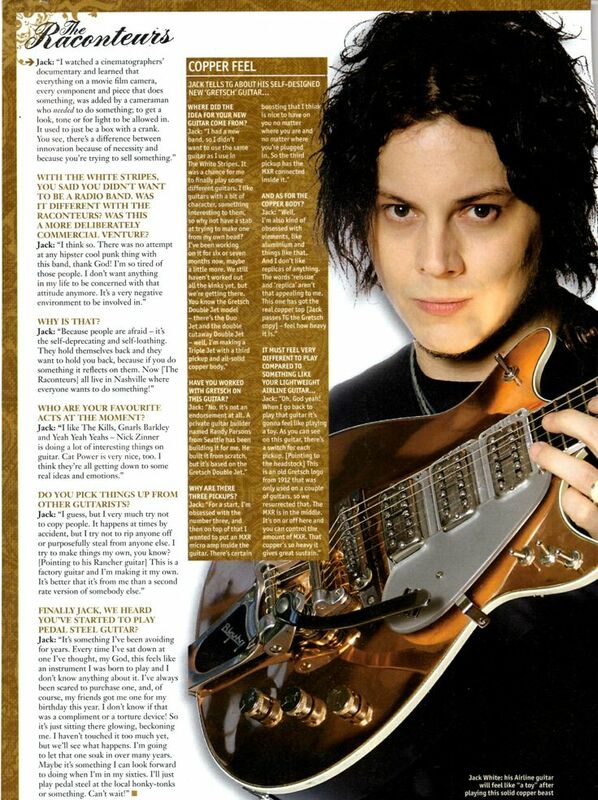 Zeke: He did say in an article (I believe it was a Rolling Stone one…) that he picked up his original White Penguin Jupiter Thunderbird in Texas a while ago (and it is original) and he pretty much uses it only in The Dead Weather. It was not made by Randy Parsons. The last photo is Jack playing a surprise show at a tiny park in downtown Whitehorse. Ah, memories. 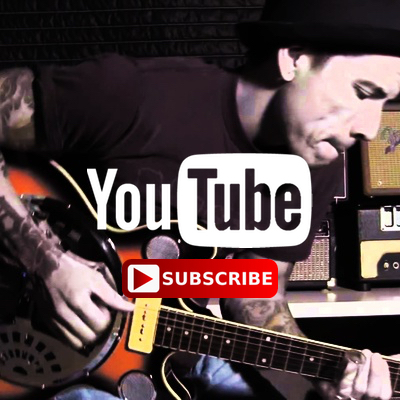 The Gibson L1 he uses isn’t the “Robert Johnson” model. The “RJ” model is a later flattop version without a trapeze tailpiece. Jack’s pictured with the earlier carved arched top version. not so sure jack white is getting away from pedals since he recently put out his own pedal . . . i think it’s the ‘bumble bee’ or some such. Great article, very cool indeed. You’re missing that one. A fender coronado maybe? Ifirst got introduced to jack white from the video It might get loud.And have a growing interest in his music. Would like to be kept in the loop. Saw the Santa Barbara bowl show and left totally wowed! !